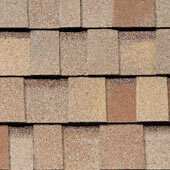 These rustic, laminated, self-sealing shingles are the perfect upgrade from standard 3-tab shingles. 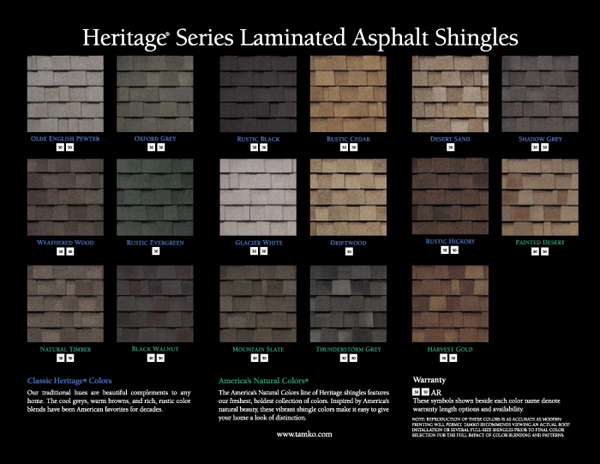 Heritage 30 shingles feature our unique Shadowtone granule blend that adds depth of appearance. They are listed by UL for wind and Class A fire resistance for maximum protection of your home. Heritage 30 self-sealing shingles give you the best of both worlds –a rustic look with the durability and protection of fiberglass. The perfect upgrade from standard 3-tab shingles and excellent for new construction. Our Shadowtone granule blend adds depth of appearance to simulate the dimensional look of wood shakes. Improves the look and value of your home without the high costs or liabilities associated with wood. Tough, laminated, double-layer, random-cut design. Made with TAMKO's own fiberglass mat, Heritage 30 shingles are the highest-quality laminated shingles in their class. Backed by a 30-year limited warranty, with 5 year Full Start, limited transferability, and a 60-month limited warranty against damage from wind up to 70 mph. TAMKO also offers Heritage 30 AR shingles that feature algae-resistant granules to protect your roof from discoloration caused by extreme humidity and moisture.